The controversy really began in Waco when it was broken a year ago that a prized yet troubled transfer name Sam Ukwuachu was still allowed to stay on scholarship after being charged with sexual assault. The school was able to keep this out of the spotlight until Ukwuachu got convicted back in August. Despite being a private school, Baylor is required by federal law -- Title IX -- to thoroughly investigate allegations of sexual violence, and provide security, counseling services and academic help to those who report assaults. Part of the law's goal is to help keep victims in school. Yet an investigation by Outside the Lines found several examples in Tanya's case, and others at Baylor, in which school officials either failed to investigate, or adequately investigate, allegations of sexual violence. In many cases, officials did not provide support to those who reported assaults. Moreover, it took Baylor more than three years to comply with a federal directive: In April 2011, the U.S. Department of Education sent a letter to all colleges and universities outlining their responsibilities under Title IX, including the need for each school to have a Title IX coordinator. 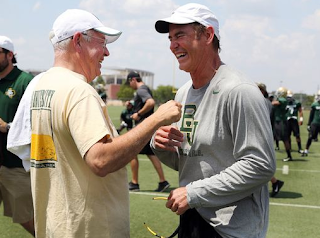 Baylor didn't hire a full-time coordinator until fall 2014. "They didn't just not respond; they responded by turning me away and telling me that it was not possible for me to receive help from them," said Tanya, whose identity is being kept private by Outside the Lines because she was the victim of a sexual assault. In 2013, the Waco Police Department wrote in a police report that it had informed Baylor officials about an off-campus incident involving former All-Big 12 tight end Tre'Von Armstead and former practice squad player Myke Chatman. Waco police also told the alleged victim they had contacted Baylor, but according to documents and interviews conducted by Outside the Lines, Baylor didn't begin looking into the allegations until Sept. 11, 2015. Baylor kicked Armstead off its football team last fall and expelled him from school in February over the allegations, documents obtained by Outside the Lines show. When Baylor coaches announced his suspension from the team, they said it came as a result of a "team rules violation." Chatman was enrolled at Baylor at the time of the incident but left after that semester. In one case from 2011, an assault at an off-campus event in Waco ended with three football players being charged and Baylor and Waco police discussing the incident. Waco police, according to documents, took extraordinary steps to keep it from the public view "given the potential high-profile nature of the incident." According to a police report obtained by Outside the Lines, Waco's investigating officer asked a commander that "the case be pulled from the computer system so that only persons who had a reason to inquire about the report would be able to access it." The report was placed in a locked office. I strongly urge all of you to go back and read all three of those stories in their entirety, frankly they're all pretty chilling. It is hard to come up with a conclusion other than that this is a university that went out of their way to protect their football players at a time when the program, under Briles, was going through an unprecedented stretch of success. In addition to broader University failings, Pepper found specific failings within both the football program and Athletics Department leadership, including a failure to identify and respond to a pattern of sexual violence by a football player, to take action in response to reports of a sexual assault by multiple football players, and to take action in response to a report of dating violence. the investigations were conducted in the context of a broader culture and belief by many administrators that sexual violence “doesn’t happen here.” Administrators engaged in conduct that could be perceived as victim-blaming, focusing on the complainant’s choices and actions, rather than robustly investigating the allegations, including the actions of the respondent. In many instances, student conduct investigators conducted cursory investigations and failed to identify and interview readily apparent witnesses or gather relevant evidence. Student conduct investigators also applied the preponderance of the evidence standard of proof in an inconsistent manner, and in many instances, required a far greater level of proof than preponderance. Football staff conducted their own untrained internal inquiries, outside of policy, which improperly discredited complainants and denied them the right to a fair, impartial and informed investigation, interim measures or processes promised under University policy. Unfortunately, a good chunk of the report is a little vague when discussing various school administrators and the kind of actions they undertook in response to these allegations. But even then, what this report describes is thoroughly appalling and speaks to a significant failing in the culture of this school. That's why the ouster of Briles, while certainly warranted, is not enough. Demoting Starr is not enough either, he's also got to go. I think the whole administration needs to be cleaned out and certainly anybody that was involved as described in the report. Baylor University consistently let down the victims and potential victims of sexual assault at the hands of players from the football team and that's a complete disgrace. It will be interesting to see what the response of the NCAA is. As we all know, the NCAA couldn't go ten steps in any investigation without stepping on a rake and thus any investigation on their part won't have me holding my breath. That said, I don't see them dropping a penalty on the level of the death penalty but I would be surprised if there wasn't some sort of significant punishment laid upon the Baylor Bears.